The Tomb of Djehutihotep at Deir el-Bersha. Hall. North Wall. In another scene from the tomb of Djehutihotep, ten men pull tight the ropes of a large fishing-net containing a fine catch of fish. 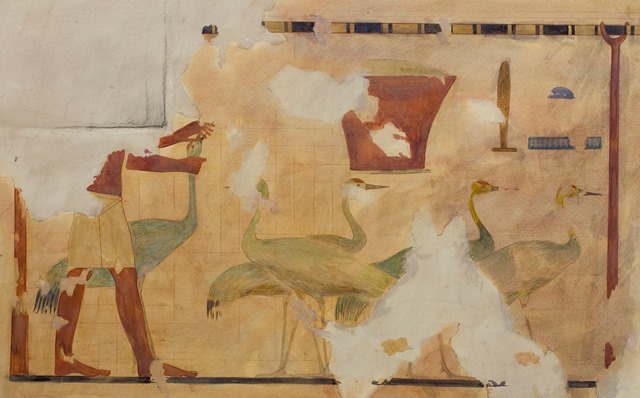 Unlike the bird hunting scene in the register above, this hunt takes place on the open water of the river Nile, represented by a strip of rippled greens with just a thick dark line to indicate the river bank, a stark contrast to the lush vegetation marking the edges of the duck pool. 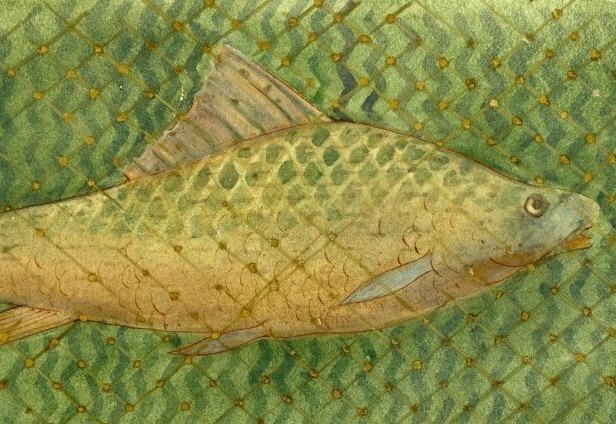 Swimming within the gold threaded net are several large fish including Golden Carp (probably Barbus bynni), and Nile Perch (Lates niloticus). In the bottom register are three rows of feeding, cooking and bringing birds, including the force-feeding of crane and geese, as well as the filleting and preserving of the caught fish. Right at the bottom is a row of offering bearers each carrying two trays aloft with the rewards of the hunt, destined no doubt for Djehutihotep's own table. We are indebted to our Griffith Institute Research Volunteers, Lee Young and John Wyatt, who compiled the catalogue for these watercolours, and also to Dr Jaromir Malek, former Keeper of the Griffith Institute Archive, who initiated the cataloguing and digitization of this collection. Helen Murray, the first Keeper of the Archive, accessioned, numbered and arranged the watercolours in their present order. 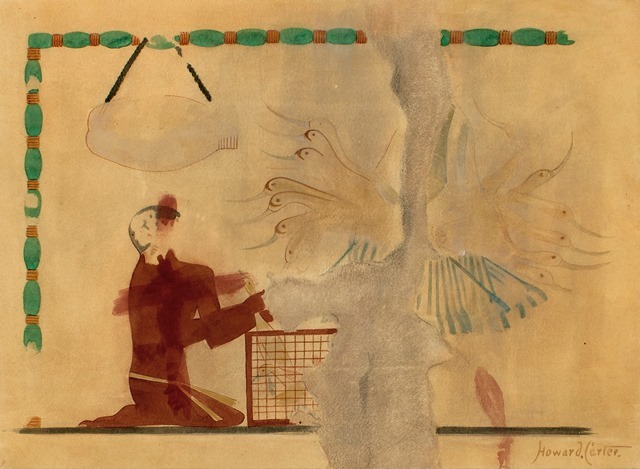 The digitization of the watercolours was carried out by Jenni Navratil, the Institute's Digital Imaging Officer, assisted by Hana Navratilova. Francisco Bosch-Puche, Alison Hobby and Cat Warsi have all made significant contributions to all stages of this project. Elizabeth Fleming edited the final catalogue and designed the web page content. A special thank you is extended to our colleagues at the Egypt Exploration Society in London for permission to use the line drawings published in Percy E. Newberry's El Bersheh i, The tomb of Tehuti-hetep .